A game by Renegade Kid for PC, PS4, Vita, Switch, Wii U, and 3DS, originally released in 2014. 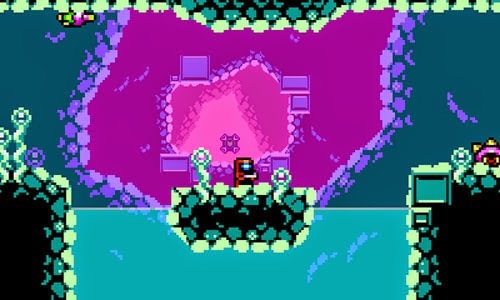 Xeodrifter is a short action-adventure game that falls squarely into the metroidvania category, and its design is heavily influenced by that of Super Metroid. In the opening scene, a spaceship collides with an asteroid, sending it spinning out of control and damaging its warp core in the process. Fortunately, there are four planets nearby, and sensors indicate that they may possess the necessary materials to execute a repair. 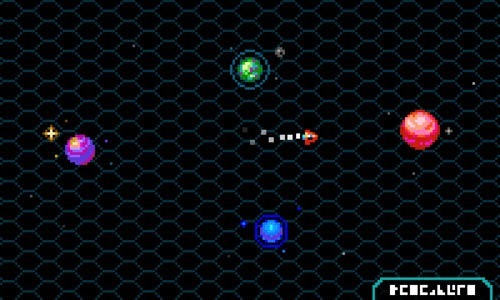 The player is free to move to any of the planets in the vicinity by maneuvering the ship to the desired planet and pressing the DOCK button. At this point, the view transitions to the interior of the ship, which sees an astronaut standing at a control panel. To his left is a save station and a teleporter that allows him to transfer to the surface. Upon exiting the ship the player finds that he has a very high nonvariable jump and the ability to duck, and his movement speed is quite fast in comparison to other games in the genre. Holding the ATTACK button allows the astronaut to fire continuously to the left, right, or up, and the player may press DOWN to duck and fire while standing on the ground, or fire straight down while jumping. 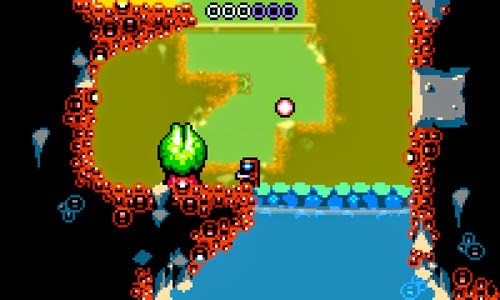 The player’s early progress is blocked by water on two of the four planets, as the astronaut can swim but he is unable to dive below the surface. Another of the planets has a pool of lava to prevent further movement, leaving only one planet that may be traversed from the start. While the game world is not made up of a single contiguous map, the developers created a map system that allows all four planets to be viewed simultaneously via a traditional metroidvania map interface. This allows the player to quickly see what progress has been made on other planets and which areas may be further explored once new abilities are acquired. New abilities are gained solely by defeating bosses. Unfortunately, all of the game’s bosses are simply palette swaps of one another, with a new attack type added in each new encounter. This lack of boss variety is uncommon in the genre, but this is most likely due to the game’s short development cycle (see 2D CRED section below). Each new encounter also sees lengthier sections where the boss is impervious to damage, requiring the player to simply dodge projectiles and melee strikes, which makes boss battles grow more tedious as the game wears on. Early encounters see the boss dashing across the screen, jumping in the air, and occasionally firing short sprays of bullets, as well as hopping into the background to launch falling blocks into the foreground. Later encounters mix these attacks with sections that require the player to hop between the foreground and background (once the proper upgrade is acquired) to avoid attacks, dodge falling boxes, and avoid burning lava. 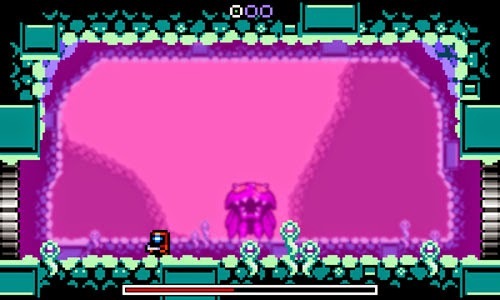 Players must also fend off a shielded version of the boss and take out small creatures spawned by the boss. 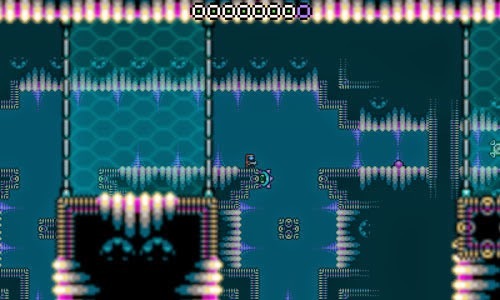 Each time you kill a boss, you gain one new ability, the first of which is a submarine form that lets you move and shoot underwater, allowing you to return to the two aforementioned planets and make a bit more progress. The submarine can freely move in all directions, but it can still only fire in four directions, making it a bit more difficult to line up shots. In addition, the craft slowly sinks when it is not moving, requiring additional adjustments when firing horizontally. 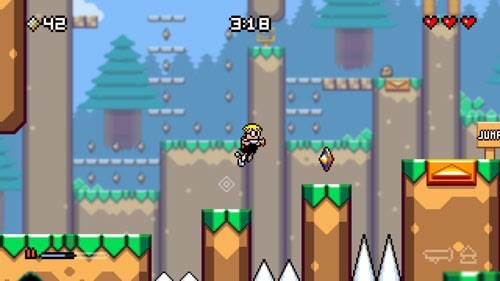 Other abilities include the Phase Shift, allowing the player to hop between foreground and background layers to bypass obstructions, just as in the developer's previous game, Mutant Mudds. 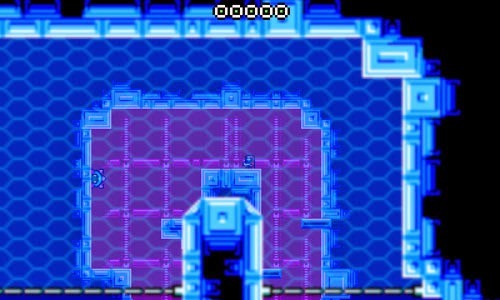 The Run ability works similarly to the Speed Booster in Super Metroid, allowing the player to dash quickly across the ground (although he is harmed when coming into contact with enemies) and dash across the surface of boiling lava. Falling in line with this is the Rocket ability, allowing the player to dash straight upward with a bit of horizontal control along the way. 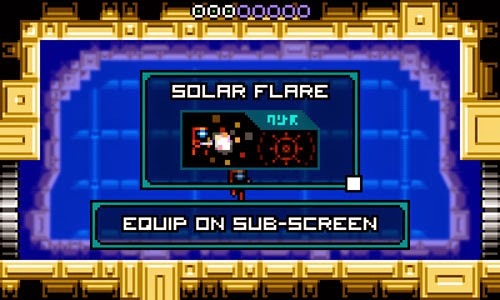 The Solar Flare is an incredibly powerful charge shot that can be used to break through certain types of barriers and destroy powerful enemies with just a couple of hits, as well as penetrating multiple weaker enemies. This upgrade must be manually equipped from the menu each time it is needed as it takes the place of the player’s main weapon. The weapon also blocks incoming projectiles, and it auto-fires if the charging projectile comes in contact with an enemy. It also automatically discharges if the player takes damage. Finally, the Phaze ability allows the astronaut to teleport over short distances, and this is used to access passageways on the far side of narrow walls. Late in the game, some of these abilities must be used in tandem, with the player swapping between layers to avoid obstacles while boosting upward or dashing along the ground. Checkpoints appear immediately before and after each boss encounter but are otherwise absent from the rest of the game. The only way to save your progress outside of a boss encounter is to return to your ship and use the onboard save station. This may mean a long hike back to your ship to preserve your progress, and enemies respawn when you leave a room and return. 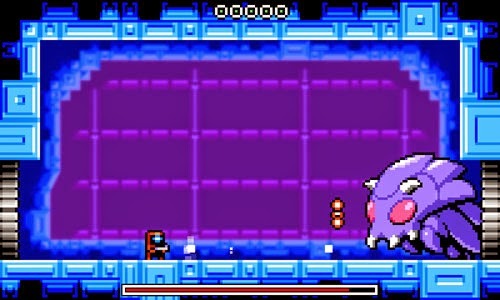 Additionally, there are very few opportunities for health restoration during the game, as killed enemies do not drop health, unlike the Metroid games that inspired this title. As such, there is no incentive or reward for defeating enemies unless they are specifically blocking your path. In each level, there is only one type of enemy that drops health restoratives, and these only appear immediately preceding boss rooms. 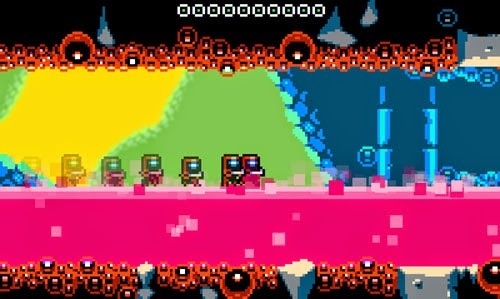 These enemies rise up out of the ground and move toward the astronaut, and each one that is killed drops an orb that restores one unit of health. The only other health restoratives come the form of hidden blocks in the floor or walls that may be destroyed to reveal a partial health restore. The player begins with only three units of health, with weak attacks reducing the meter by one unit, strong attacks reducing it by two, and a few tough beasts can take off a full three units with a single hit. Fortunately, the player may uncover health upgrades during his adventure, extending the meter to a possible 12 units, although many of these upgrades are very well hidden, some of them appearing behind false walls. Discovering a health upgrade also fully restores the astronaut’s health when it is picked up. The player may also find gun upgrades in the same way. The astronaut starts with just a basic slow-firing pellet chucker, but there are 12 units of gun upgrades to be found, allowing the player to enhance his firepower in a variety of ways. There are five possible upgrade types, allowing the player to adjust the firing rate, power, range, and path of travel for his projectiles. The more points that are assigned to a specific attribute, the more it affects the projectile; for instance, stacking every upgrade into the weapon’s speed attribute will greatly increase its rate of fire. These effects may be mixed and matched as well. For instance, the player may opt for a fast-firing wave beam, a long range 3-way fire, or just load up on heavy firepower to take down bosses… or any combination of these. Up to six units may be placed into any of the categories, and they may be swapped in and out as the situation demands, allowing for a great deal of customization. Players may also store up to three configurations and swap between them as needed. 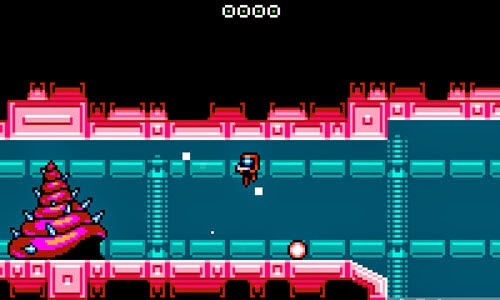 Xeodrifter was developed by Renegade Kid, a studio founded in 2007 by Jools Watsham and Gregg Hargrove. The developers are known for their work on Mutant Mudds, as well as their Moon and Dementium series. Jools is the creative director for the studio and worked previously in the industry on such titles as Turok 2: Seeds of Evil and The Red Star. Gregg is the studio’s art director, and has worked on such titles as Stubbs the Zombie and Vexx. 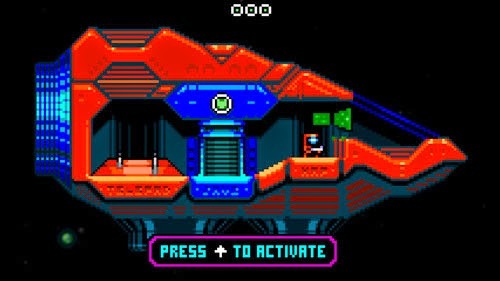 Xeodrifter got its start in early 2014 when Jools decided to create a “demake” mockup of the studio’s Moon Chronicles game in the form of a 2D action-adventure title. In April, following the failure of their Cult County Kickstarter campaign, the studio found itself needing to get a game out before the end of 2014 in order to stay afloat. Rather than scaling back the scope of Treasurenauts which was in development at the time, Jools decided to revisit his demake and turn it into a game that could be released in a short span. The project began that summer and was released in December, borrowing some design elements from the studio’s other 2D projects in order to speed up the development process. 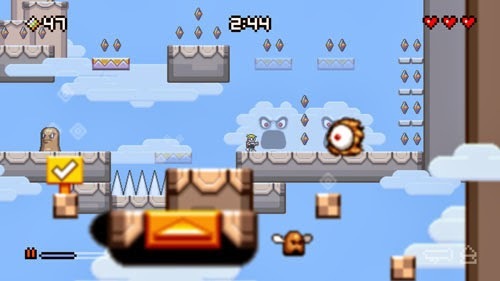 The studio’s prior 2D success came in the form of Mutant Mudds, a game that was originally conceived as a 3D third-person shooter, but the design did not attract a publisher, so it was reimagined as a traditional 2D platformer. The game was originally released in 2012, followed by an enhanced version called Mutant Mudds Deluxe in 2013. The game stars Max, a video game-loving kid who must leap into action when a meteor crashes down, bringing with it a variety of mud-based foes. Max hops through the environment with a water-assisted jetpack and sprays his enemies with a water gun. 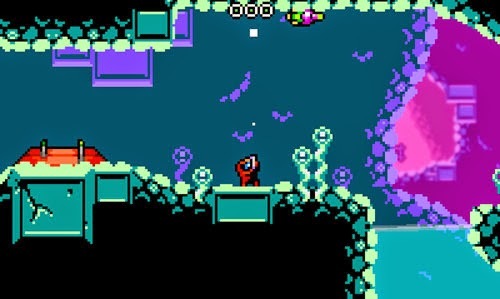 In addition, Max must hop between foreground, midground, and background layers in order to proceed, operating similarly to the Plane Shift ability in Xeodrifter.